This was the year I began playing with image editors. Microsoft had just released a program called Picture It. The program came with a collection of templates. 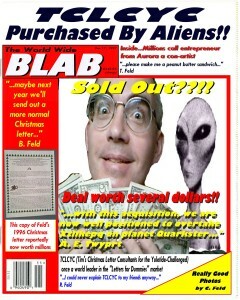 One of them was a magazine cover called The World Wide Blab. That’s all I needed…a new program to try and find a use for and a template ripe for exploiting. 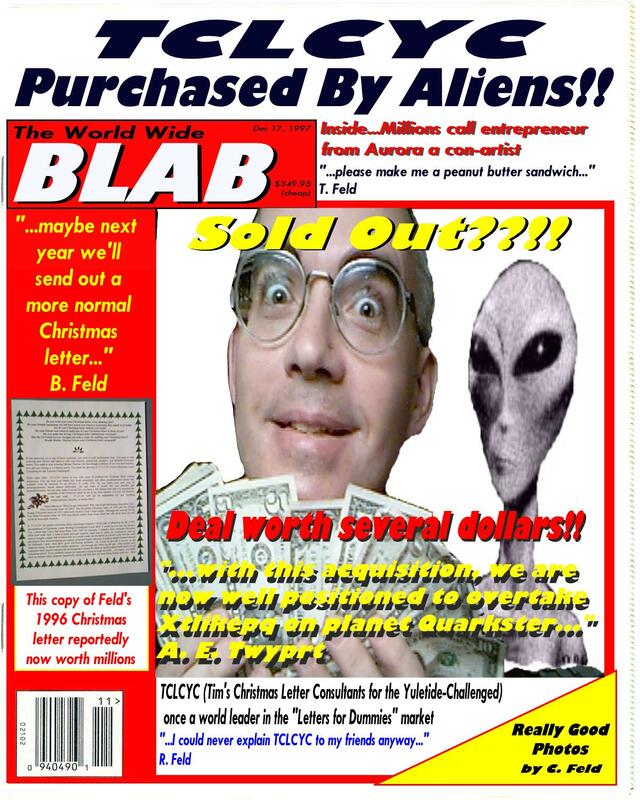 Not sure where the idea for an alien buyout of TCLCYC came from (actually, I’m not quite sure where any of my ideas come from). 1997 was the first year I recruited assistance from my innocent and unsuspecting family. I asked my 11 year-old son, Chris, to take a picture of me holding some money (looks like about $24). I later spent that money on cheese and a set of brass hinges. He used a Kodak DC20 digital camera borrowed from my employer. I couldn’t take the picture myself as the camera lacked a timer feature (remedied in future digital cameras). The photo editing was pretty crude by today’s standards but impressive nonetheless. I did not take the picture of the alien. I stole it from an issue of The National Enquirer. I later returned it with a heart-felt apology. You may notice the word “cheap” under the listed price of the magazine. That comes from my aforementioned history with Alfred E. Neuman and Mad Magazine. Every issue had “cheap” under the price. It made me smile. Each family member was attributed with either a quote or credit for work. One was actually true…Chris really did take really good photos (except it was just one photo). Two of the quotes, although highly plausible, were complete fabrications. Even my quote is not true…I never asked…I always made my own peanut butter sandwiches (in fact, I just did so again this morning).